It looks like 2016 will be a year full of interesting conferences. I already pointed you to EGU, IMSC and EMS before. Here is an update with three upcoming European meetings, including two close deadlines. The marine climate data community will hold its main workshop this July (18 to 22). The deadline has just been prolonged to the 6th of April, Wednesday next week. The metrologists (no typo) organize a meeting on climate data, MMC2016. It will take place from 26 to 30 September and will be organized together with the WMO TECO conference. And naturally we will have the European Meteorological Society meeting in Autumn. This year is an ECAC year (European Conference on Applied Climatology). The abstract submission deadline is in about three weeks, 21 Apr 2016, during EGU. So start writing soon. As always we will have a session on "Climate monitoring; data rescue, management, quality and homogenization" for the homogenization addicted readers of this blog. If you know of more interesting conferences, do add them in the comments. This looks like an invitation of people working on land data to also participate. I just asked some colleagues on the homogenization list and it looks like there are a decent number of weather stations near the coast. We could compare them to marine observations, I would especially be interested in comparing sea surface temperature observations. This workshop is free to attend, but participants must register. International workshop on Metrology for Meteorology and Climate in conjunction with WMO TECO 2016 conference & Meteorological Technology World Expo 2016. It will be held in Madrid Spain from 26 to 30 September 2016. During the last years an increasing collaboration has been established between the Metrology and Meteorology communities. EURAMET, the European association of metrology Institutes, is funding several projects aiming at delivering results of valuable impact for the meteorology and climatology science. The key aspect of such projects is the traceability of measurements and uncertainties of measured physical and chemical quantities describing the earth atmosphere. The MMC conference aims to give an opportunity to those two communities to present and discuss needs, methods, expertise and devices for cooperating in producing better data. The invitation is addressed to the metrology, meteorology and climate scientific communities and operators. Starting with the first MMC 2014 in Brdo, Slovenia, this time the MMC 2016 is organized Madrid, Spain, in conjunction with CIMO-TECO conference. As far as I know the abstract deadline has not been determined yet, but write the date into your agenda, bookmark the homepage and contact the organizers to give you a notice once the deadline is known. The conference theme of the Annual Meeting of the European Meteorological Society is: Where atmosphere, sea and land meet: bridging between sciences, applications and stakeholders. It will be held from 12 to 16 September 2016 in Trieste, Italy. The abstract submission deadline is 21 April 2016, during EGU2016. Next to this session, readers of this blog may also like: Climate change detection, assessment of trends, variability and extremes. And I personally like the session on Spatial Climatology, which has a lot to do with structure and variability. Top photo by Martin Duggan, which has a CC BY 2.0 license. It has been studied over and over again, in very many ways: in global temperature datasets urban stations have about the same temperature trend as surrounding rural stations. There is also massive evidence that urban areas are typically warmer than their surroundings. For large urban areas the Urban Heat Island (UHI) effect can increase the temperature by several degrees Celsius. A constant higher temperature due to the UHI does not influence temperature changes. However, when cities grow around a weather station, this produces an artificial warming trend. Why don’t we see this in the urban stations of the global temperature collections? There are several reasons; the one I want to focus on in this post is that stations do not stay at the same place. Urban stations are often relocated to better locations, more outside of town. It is common for urban stations to be moved to airports, especially when meteorological offices are moved to the airport to assist in airport safety. Also when meteorological offices can no longer pay the rent in the city center, they are forced to move out and take the station with them. When urban development makes the surrounding unsuited or when a volunteer observer retires, the station has to move, it makes sense to then search for a better location, which will likely be in a less urban area. Since relocations of that kind are likely to result in a cooling, the Parallel Observations Science Team (ISTI-POST) wants to have a look at how large this effect is. As far as we know there is no overview study yet, but papers on the homogenization of a station network often report on adjustments made for specific inhomogeneities. We, that is mainly Jenny Linden of Mainz University, had a look in the scientific literature. Let’s start in China were urbanization is strong and can be clearly seen in the raw data of many stations. They also have strong cooling relocations. The graph below from Wenhui Xu and colleagues (2013) shows the distribution of breaks that were detected (and corrected) with statistical homogenization for which the station history indicated that they were caused by relocations. Both the minimum and the maximum temperature cool by a few tenth of a degree Celsius due to the relocations. The distribution of the breaks that were due to relocations for the maximum temperature (left) and minimum temperature (right). The red line is a Gaussian distribution for comparison. Going more in detail, Zhongwei Yan (2010) and colleagues studied two relocations in Beijing. They found that the relocations cooled the observations by −0.81°C and −0.69°C. Yuan-Jian Yang and colleagues (2013) find a cooling relocation of 0.7°C in the data of Hefei. Clearly for single urban stations, relocations can have a large influence. They show an example with 5 stations where one station (Khoramabad) has a relocation in 1980 and another station (Shahrekord) has two relocation in 1980 and 2002. These relocations have a strong cooling effect of 1 to 3 degrees Celsius. 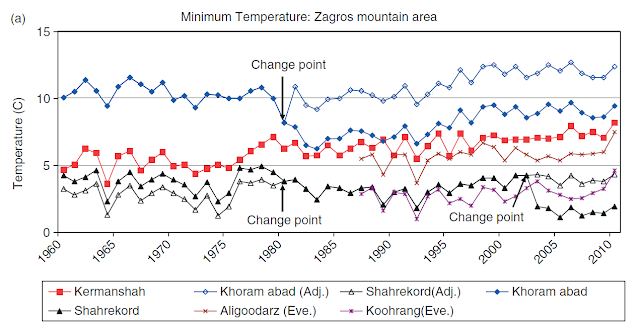 Temperature in 5 stations in Iran, including their adjusted series. Table with the average bias of inhomogeneities found in Finland, Sweden, Norway and the UK in winter (DJF), spring (MAM), summer (JJA) and autumn (SON) and in the yearly average. Changes in the surrounding, such as urbanization or micro-siting changes, made the temperatures higher. This was counteracted by more frequent cooling biases from changes in the thermometers and the screens used to protect the thermometers, by relocations and by changes in the formula used to compute the daily mean temperature. Concluding, relocations are a frequent type of inhomogeneity. They produce a cooling bias. For urban stations the cooling can be very large. For the average over a region, the values are smaller, but especially because they are so common, they will have most likely a clear influence on global warming in raw temperature observations. 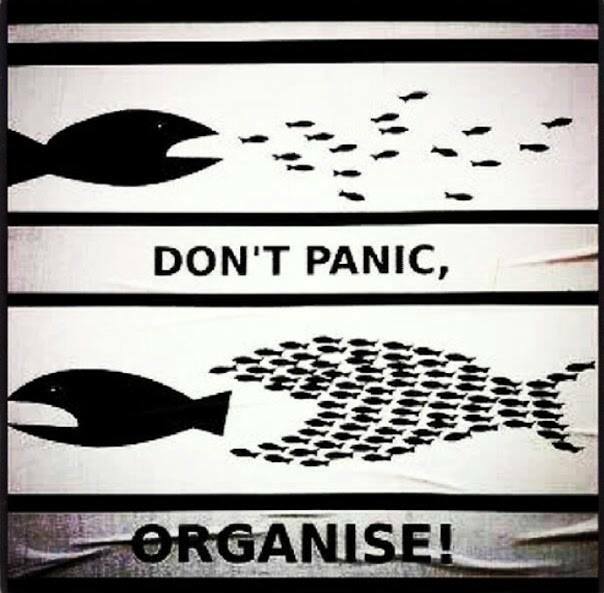 One problem with studying relocations is that they are frequently accompanied by other changes. Thus you can study them in two ways: study only relocations where you know that no other changes were made or study all historical relocations whether there was another change or not. The first set-up allows us to characterize the relocations directly, to understand the physical consequences to move for example a station from the center of a city / village to the airport. In this way the differences are not subject to other changes specific to a network. So, the results can be easily compared between regions. The problem is that only a part of the parallel measurements available satisfy these strict conditions. Conversely, for the second design (taking all historical relocations, also when they have another change) the characterization of the bias will be limited to the datasets studied and we will need a large sample to say something about the global climate record. But on the other hand, we can also analyze more data this way. There are also two possible sources of information. The above studies relied on statistical homogenization comparing a candidate station to its neighbors. All you need to know for this is which inhomogeneities belong to a relocation. A more direct way to study these relocations is by using parallel measurements at both locations. This is especially helpful to study changes in the variability around the mean and in weather extremes. That is where the Parallel Observation Science Team (ISTI-POST) comes into play. It is also possible to study specific relocations. The relocation of stations to airports was an important transition, especially around the 1940s. This temperature change is likely large and this transition quite frequent and well documented. One could focus on urban stations or on village stations, rather than studying all stations. One could make a classification of the micro and macro siting before and after the relocation. For micro-siting the Michel Leroy (2010) classification could be interesting; as far as I know this classification has not been validated yet, we do not know how large the biases of the 5 categories are and how well-defined these biases are. Ian Stewart and Tim Oke (2012) have made a beautiful classification of the local climate zones of (urban) areas, which can also be used to classify the surrounding of stations. Example of various combinations of building and land use of the local climate zones of Stewart and Oke. There are many options and what we choose will also depend on what kind of data we can get. Currently our preference is to study parallel data with identical instrumentation at two locations, to understand the influence of the relocation itself as well as possible. In addition to study the influence on the mean, we are gathering data on the break sizes found by statistical homogenization for breaks due to relocations. The station histories (metadata) are crucial for this in order to clearly assign breakpoints to relocation activities. It will also be interesting to compare those two information sources where possible. This may become one study or two depending on how involved the analysis will become. This POST study is coordinated by Alba Guilabert and Jenny Linden and Manuel Dienst are very active. Please contact one of us if you would like to be involved in a global study like this and tell us what kind of data you would have. Also if anyone knows of more studies reporting the size of inhomogeneities due to relocations, please let us know. I certainly have seen more such tables at conferences, but they may not have been published. Brunet M., O. Saladie, P. Jones, J. Sigró, E. Aguilar, et al., 2006: The development of a new daily adjusted temperature dataset for Spain (SDATS) (1850–2003). International Journal of Climatology, 26, pp. 1777–1802, doi: 10.1002/joc.1338. See also: a case-study/guidance on the development of long-term daily adjusted temperature datasets. Leroy, M., 2010: Siting classifications for surface observing stations on land. In WMO Guide to Meteorological Instruments and Methods of Observation. "CIMO Guide", WMO-No. 8, Part I, Chapter 1, Annex 1B. 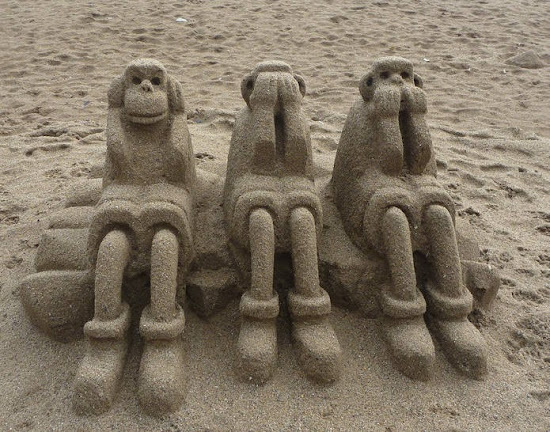 Rahimzadeh, F. and M.N. 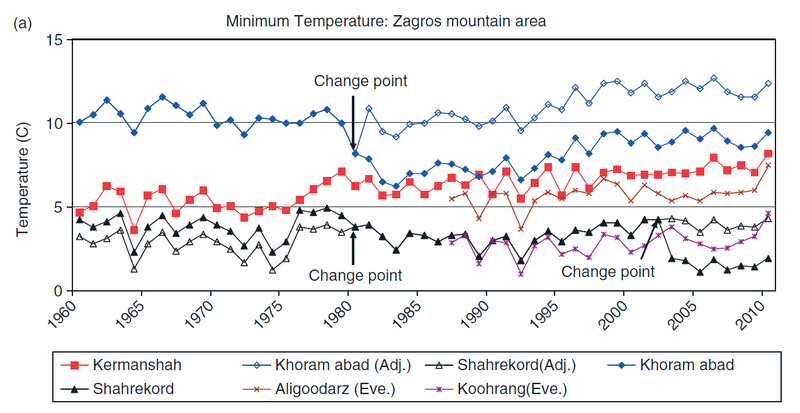 Zavareh, 2014: Effects of adjustment for non‐climatic discontinuities on determination of temperature trends and variability over Iran. International Journal of Climatology, 34, pp. 2079-2096, doi: 10.1002/joc.3823. Stewart, I.D. and T.R. Oke, 2012: Local climate zones for urban temperature studies. Bulletin American Meteorological Society, 93, pp. 1879–1900, doi: 10.1175/BAMS-D-11-00019.1. See also the World Urban Database. Tuomenvirta, H., 2001: Homogeneity adjustments of temperature and precipitation series - Finnish and Nordic data. International Journal of Climatology, 21, pp. 495-506, doi: 10.1002/joc.616. Xu, W., Q. Li, X.L. Wang, S. Yang, L. Cao, and Y. Feng, 2013: Homogenization of Chinese daily surface air temperatures and analysis of trends in the extreme temperature indices. Journal Geophysical Research Atmospheres, 118, doi: 10.1002/jgrd.50791. Syrakova M. and Stefanova M., 2009: Homogenization of Bulgarian temperature series. International. Journal Climatology, 29, pp. 1835-1849, doi: 10.1002/jov.1829. Yan ZW; Li Z; Xia JJ. 2014. Homogenisation of climate series: The basis for assessing climate changes. Science China: Earth Sciences, 57, pp 2891-2900, doi: 10.1007/s11430-014-4945-x. 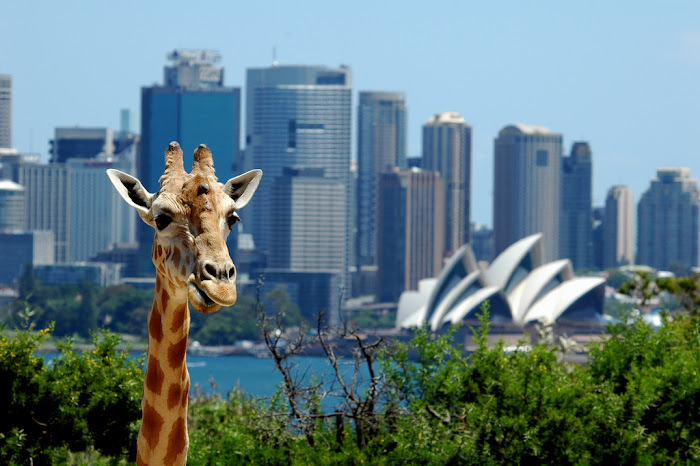 * Photo at the top "High Above Sydney" by Taro Taylor used with a Attribution-NonCommercial 2.0 Generic (CC BY-NC 2.0) license. The bias in the American mass media are driving me crazy. So let me get onto my little soap box. You can see the bias when they add the super-delegates to the pledged delegates to pretend that Clinton has a higher lead. 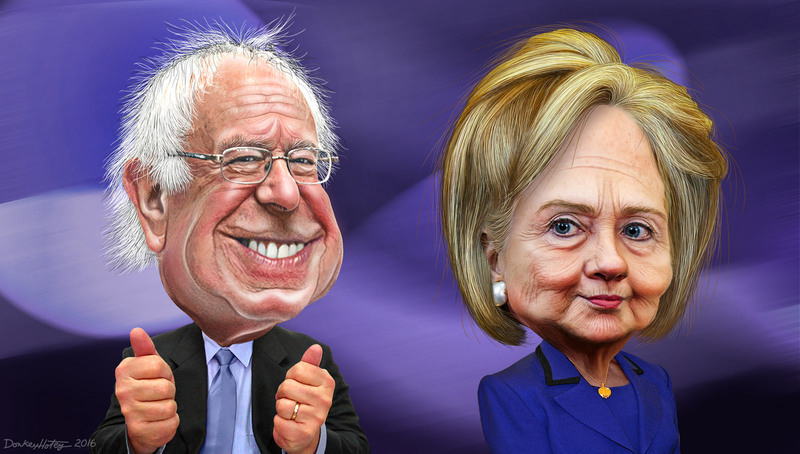 If these super-delegates would actually vote against the wish of the primary voters, the disgust will be large enough to make sure that the Democrats would lose. You can see the bias in that the media hardly speaks about money in politics. A main topic in both primaries. What I want to talk about today is that the media generally assumes that Hillary Clinton is more electable in the general presidential election than Bernie Sanders. Often in the dismissive implicit way of the establishment. That can be a real opinion, but the evidence goes into another direction. I am happy to admit that I am also biased. For me Bernie Sanders is clearly the best candidate, mainly because he wants to get money out of politics. Money in politics is bad for the public debate, for democracy, for the environment and for the economy. Politicians who have to do what their donors tell them have no flexibility to compromise and get things done; they have to defend indefensible positions. This leads to a childish political debate. Nearly all Republican representatives in Washington reject basic scientific findings on climate change. This is childish. It is equivalent to putting your fingers in your ears and singing la, la, la, la. It matches the donor's preferences, but does not match their voter base. Half of the Republican voters support policies to reduce greenhouse gasses.